The Irish have seen the same litany of corruption as Americans. They've just about had enough. And the situation is worsening. combining boring economics with some side-splitting comedy. global problems which favor people before NWO cartel banks. well known critics of neo-liberal economics and the Fed in the USA. This event is the opening salvo in a people's battle. The next three months are going to see sparks fly. Kilkenny City, Ireland on November 11th - 14th 2010.
thousands of questions, hundreds of answers, one weekend. If you’re like us you’re finding all economics complicated and frightening in equal measure right now. What if we were to put some world class economic thinkers together with some of the best comic analytical minds available and see if they can’t make all this easier to understand in a way that is entertaining, informative and funny? Money is serious. Comedy is funny. This could be seriously funny. And seriously useful too. Maybe there’s a way of looking at all this, a way which acknowledges how absurd where we are now is and looks for a way out with insight, humour and originality rather than depressing analysis of how we’re all going to hell in a hand basket. Our comedians, Colin Murphy, Karl Spain, Fred MacAulay, Des Bishop, Neil Delamere and Barry Murphy have all shown an ability to deal with the dark side of life without depressing their audience. Our economists are world class, all offering a unique take on what just happened, what will happen and what needs to happen next. Maybe if we put them together we’ll come away with a unique perspective and understanding of where we are, how we got here and were we need to go next. And we might actually enjoy ourselves getting there. Find out how one of America’s most successful investors – Peter Schiff – got everything right, from sub-prime to banks, from the dollar to gold and made a fortune in the process. Meet Bill Black, whose mastery of banking fraud and white collar crime has defined a generation; or listen to the astonishing clarity and razor-sharp insights of best-selling author, John Lanchester. Discover why brilliant economist Ha-Joon Chang believes that the washing machine has changed our lives more than the Internet and why globalisation isn’t making the world richer. Ireland will try to win support this week from the European Union to avoid a Greek-style bailout as investors balk at buying the country’s bonds. EU Economic and Monetary Affairs Commissioner Olli Rehn arrives in Dublin today for a two-day visit after the government laid out a plan last week to cut spending and raise taxes by as much as 6 billion euros ($8.4 billion) in 2011. Where the first round of the banking crisis centred on a few dozen large developers, [b]the next round will involve hundreds of thousands of families with mortgages. Between negotiated repayment reductions and defaults, at least 100,000 mortgages (one in eight) are already under water, and things have barely started. I have not noticed any great decline in house prices in Dublin. They are still quite high. respected critic of neo-liberal economics, Ha-Joon Chang. is a terrific asset to have on board. 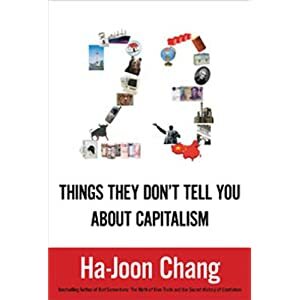 Ha-Joon Chang, Reader in the Political Economy of Development at Cambridge University, has written a fascinating book on capitalism's failings. He also wrote the brilliant Bad Samaritans: The Myth of Free Trade and the Secret History of Capitalism. Martin Wolf of the Financial Times says he is `probably the world's most effective critic of globalisation'. Chang takes on the free-marketers' dogmas and proposes ideas like - there is no such thing as a free market; the washing machine has changed the world more than the internet has; we do not live in a post-industrial age; globalisation isn't making the world richer; governments can pick winners; some rules are good for business; US (and British) CEOs are overpaid; more education does not make a country richer; and equality of opportunity, on its own, is unfair. He notes that the USA does not have the world's highest living standard. Norway, Luxemburg, Switzerland, Denmark, Iceland, Ireland, Sweden and the USA, in that order, had the highest incomes per head. On income per hours worked, the USA comes eighth, after Luxemburg, Norway, France, Ireland, Belgium, Austria and the Netherlands. Japan, Switzerland, Singapore, Finland and Sweden have the highest industrial output per person. Free-market politicians, economists and media have pushed policies of de-regulation and pursuit of short-term profits, causing less growth, more inequality, more job insecurity and more frequent crises. Britain's growth rate in income per person per year was 2.4 per cent in the 1960s-70s and 1.7 per cent 1990-2009. Rich countries grew by 3 per cent in the 1960s-70s and 1.4 per cent 1980-2009. Developing countries grew by 3 per cent in the 1960s-70s and 2.6 per cent 1980-2009. Latin America grew by 3.1 per cent in the 1960s-70s and 1.1 per cent 1980-2009, and Sub-Saharan Africa by 1.6 per cent in the 1960s-70s and 0.2 per cent 1990-2009. The world economy grew by 3.2 per cent in the 1960s-70s and 1.4 per cent 1990-2009. So, across the world, countries did far better before Thatcher and Reagan's `free-market revolution'. Making the rich richer made the rest of us poorer, cutting economies' growth rates, and investment as a share of national output, in all the G7 countries. Chang shows how free trade is not the way to grow and points out that the USA was the world's most protectionist country during its phase of ascendancy, from the 1830s to the 1940s, and that Britain was one of world's the most protectionist countries during its rise, from the 1720s to the 1850s. He shows how immigration controls keep First World wages up; they determine wages more than any other factor. Weakening those controls, as the EU demands, lowers wages. He challenges the conventional wisdom that we must cut spending to cut the deficit. Instead, we need controls capital, on mergers and acquisitions, and on financial products. We need the welfare state, industrial policy, and huge investment in industry, infrastructure, worker training and R&D. As Chang points out, "Even though financial investments can drive growth for a while, such growth cannot be sustained, as those investments have to be ultimately backed up by viable long-term investments in real sector activities, as so vividly shown by the 2008 financial crisis." This book is a commonsense, evidence-based approach to economic life, which we should urge all our friends and colleagues to read. There is one and ONLY one reason why a house does not sell: the price is too high. And if the price is too high then the seller is not really that interested in selling! their counterparts in the USA (via Fan/Fred/HAMP/Fed-MBS/etc.). This game: prevent houses crashing to their real value! The other crumbling dam against mass mortgage default is house prices. House prices are driven by the size of mortgages that banks give out. out mortgages at 5 per cent, to maintain an artificial floor on house prices. will destroy their balance sheets in the long term? Yes. But what long term is that? There is only now. Only short term. Only survival. The 'free' market is soooooo f&%ked. A student protest against rising tuition fees has turned violent with demonstrators forcing their way into a building and smashing windows as they approached Parliament. A group barged into the lobby of Millbank Tower (the HQ of New Labour, remember? ), near the headquarters of the Tory party, before being forced out by police and security officers. They then began setting fire to placards outside the entrance. Windows in the office block were smashed and a number of smoke bombs thrown. Dozens of police surrounding the entrance were pelted with water bottles and jostled by the passing protestors. Up to 50,000 people, many waving placards, are marching though the streets of London in the biggest show of opposition to the Coalition Government. Central Bank of Kilkenomics Launch! Forget the Euro -- let's all use Marbles instead! It's going to be the strongest European currency this weekend . . . well, in Kilkenny, the Marble City at any rate. The 'Marble' money was launched yesterday ahead of the Kilkenomics Festival in the city, which merges the unlikely bedfellows of economics and comedy. So while doom and gloom may be all the rage, now it's time to have a good laugh at it all. Top comedians such as Des Bishop and Karl Spain, along with economic experts from home and abroad, including the former Argentinian economy minister Martin Lousteau and Irish Independent columnist David McWilliams, will entertain and inform at 24 events in venues all over Kilkenny city. Mr McWilliams showed off the new money after he joined forces with Kilkenny Cat Laughs festival organiser Richard Cooke to organise the four-day event, which starts tomorrow. "Money is serious. Comedy is funny. This will be seriously useful. And seriously funny, too," organisers say. Mr McWilliams insists there are alternatives to our budget woes. "It's never too late to renegotiate the bank bailout," he said, adding that ordinary people were paying for the mistakes of wealthy people who "gambled" on banks. "What's happening now and always happens in a crisis in Ireland is the insiders set the policy and outsiders pay the bill. In the '50s we'd a big crisis and 500,000 people were forced to emigrate -- they're the outsiders -- out of sight, out of mind." I did some reading around after seeing that last name "Schiff"....seems like Peter is related to the "good" ol' Jacob Schiff and I don't think Jacob Schiff needs an explanation or introduction. Thats potentially scary. It also looks like Peter's brother works for George Soros. Curious, Big Boss; one is thunkin' upon similar lines. Odd how Max Kieser wasn't invited, though he covered it, in the Russian Federation of all places, on RT. get into your Ford Cortina MkII and get to Kilkenny and cover it. We miss your radio broadcasts.